In my story Donor Duet, I mention that Katy was Brazosport High School’s 1976 Howdy Queen (an honor bestowed on the friendliest freshman girl) despite the fact that she was already kinda howdy kingly. The other day, Katy found her Howdy Queen sash (I didn’t even know such a thing existed), and Waylon proudly tried it on. 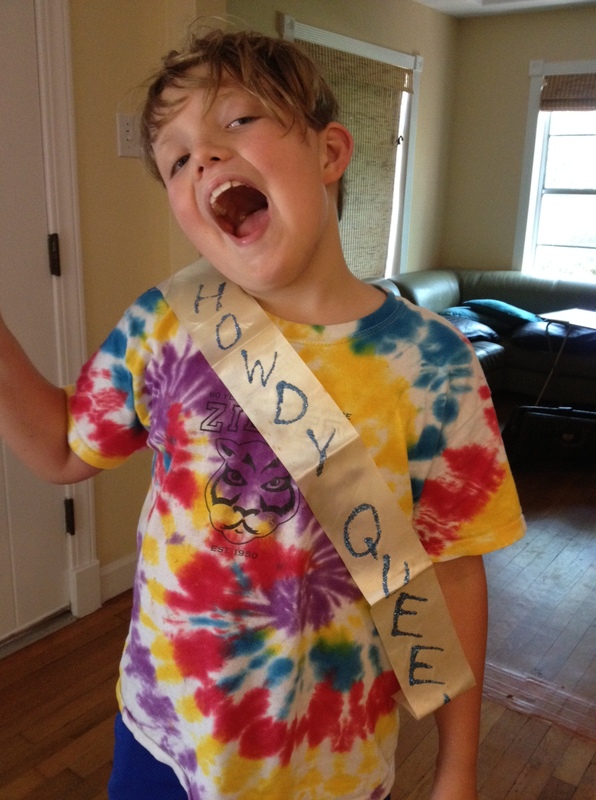 Waylon models the Howdy Queen sash. As long as I’m sharing pictures, I wanted to post this one from earlier in the summer, when our family was featured in a story about Trinity United Methodist Church. This interview caused me to vacillate wildly. The premise was marriage equality, and it was easy to answer the reporter’s questions about how long Katy and I have been together, when we got married, and when we had Waylon. After I hung up the phone, I realized that I had inadvertently left out a huge swath our lives together, so I called the reporter back. Do you have a minute? 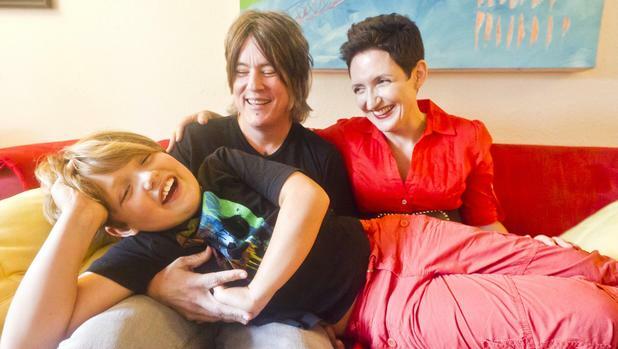 I forgot to say that my wife identifies as transgender–actually genderqueer, which is somewhere on a spectrum of masculine and feminine–and it’s important to mention that Trinity is also a trans-affirming church. Poor man, I could tell he was worried that he’d wasted 20 minutes of his life. I felt bashful about leading him down the mazelike path of multiple identifications, but he did ask…sort of. The interview wasn’t the end of my dithering. 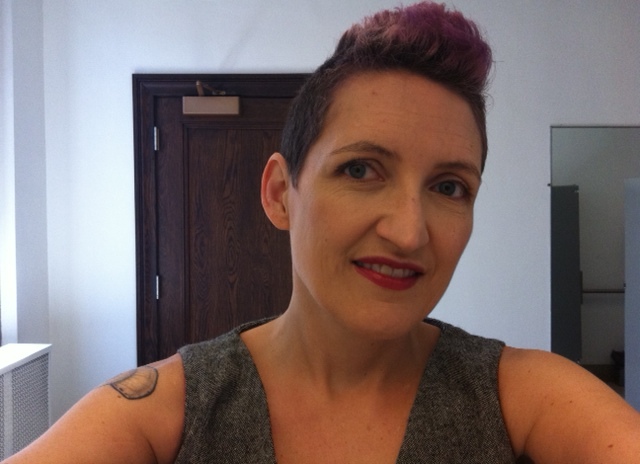 The worst part was my hair–my lovely lavender hair! For some reason, I decided to dye it dark brown for the photograph, and then regretted it immediately. It’s taking forever to grow out, and I consider my many bad hair days as a lengthy object lesson. Next time I’m interviewed, I’ll remember to resist the magnet-pull of fake representativeness and respectability. My lovely lavender hair is gone, and it’s all my own fault!